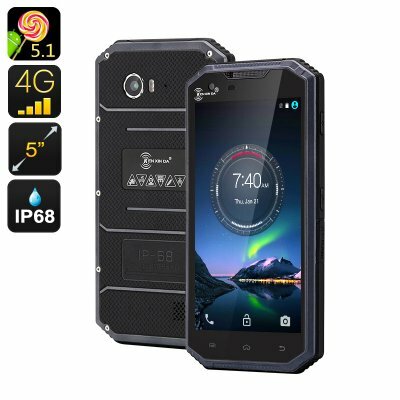 Successfully Added HK Warehouse KEN XIN DA PROOFINGS W7 Rugged Smartphone - 4G, Dual SIM, Android 5.1, 5 Inch 720P, Pedometer, IP68 (Grey) to your Shopping Cart. Enjoy great connectivity, dual SIM support, a powerful processor, and a strong resistance to elements with the waterproof KEN XIN DA PROOFINGS W7 rugged phone. Don't let your smartphone’s fragility hold you back from living the life filled with fun outdoor adventures. With the KEN XIN DA PROOFINGS W7 rugged smartphone, you won’t have to worry. The Android phone comes with IP68 waterproof rating, making it resistant to drops, sand, dust and water. The rugged mobile phone also comes with a pedometer for tracking activity and an FM radio to keep you company. With 4G on two SIM cards, you will be able to stay well-connected no matter where the fun takes you — and with two mobile accounts on one phone, you can easily separate work and social life. Android 5.1 provides a responsive interface and a great platform for getting more apps, games and tools from the Play Store. The 5 inch 720P screen makes the rugged smartphone is portable, yet makes sure you can view all your media in great quality and detail. The 2800mAh battery offers up to 6 hours of continuous talk time + 120 hours on standby. You will have two cameras for capturing interesting moments, making videos, taking selfies and more. Use your rugged Android smartphone to the full of its abilities: don’t worry about the weather, leaving it lying on the ground, bringing along to the beach or even taking it rafting. The KEN XIN DA PROOFINGS W7 Rugged Smartphone comes with a 12 months warranty, brought to you by the leader in electronic devices as well as wholesale Android Phones..